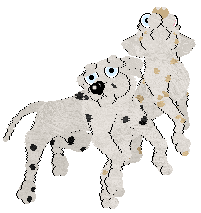 We are A Petz/Crew site based mostly around Petz 4, don't know what Petz is? Click Here. I have been a member of the Petz Community with intervals since 2010, originally focusing on breeding Great Danes and then later on, Labradors. These days however, I simply do not have enough time to put towards large breeding projects and so mainly focus on showing, very occasionally breeding my pedigree Dalmatians. All my Petz are naturally raised, which means the game is played as intended with minimal use of PetzA. We are Petz Kennel Club members. "Ohana Nui means extended family, in the sense off going beyond direct family members to include individuals who may not be related by blood or even marriage."